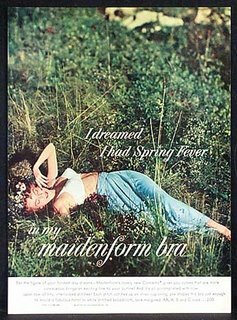 ag dude, post asb 'n foto van jou in jou maidenform bra...dit sal my bleddie jaar maak. well, disco fever started with itchy feet....and look where that ended up...bad hairdos, The Hustle, tight pants for men....damn. You need Panado and Brufen, and lots of clear fluids. I like blacks tea - it decongests and rehydrates. Doctors.... give you a drug for everything! Embrace your spring fever. It means winter is nearly over. Oh how I hate spring fever! Good luck with that.